Got back from a week in the Bahamas a week or so ago, whilst I was out there I had a couple of full days fishing with “the born free” I have to say captain Herbie and first mate Bruno are top blokes an equally as good fishermen. The Cap certainly know where the fish are we had a great couple of days fishing with lots of little grunt, yellow tail a few strawberry grouper a hand full of sharks (biggest 250lb bull shark) we also lost an approx 18ft tiger shark (PLEASE NOTE BORN FREE NO LONGER PARTICIPATES IN SHARK FISHING!) and a massive snapper (in the pic)…… But theres plenty fish out there people and there’s no one id rather catch them with than Capitan Herbie and Bruno, they make you feel welcome from the moment you get on board to the minute you leave the docks after a full day at it! 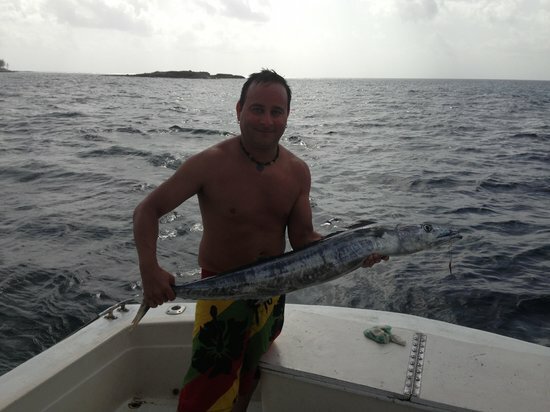 The Boss Nick is also a very welcoming man who no doubt knows his stuff in Bahamian fishing…. All in all if your thinking of doing a deep sea Bahamian fishing trip, maximise you experience and chance of putting a slab on the boat and GO with BORN FREE!!!!! Highly recommended Captain and Charter company to go fishing with. A massive thanks to Nick, Herbie and Bruno for an unforgettable experience and thanks to you all for helping me catch my new personal best!!! 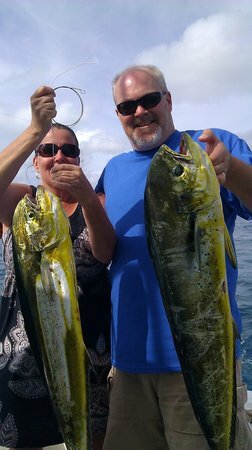 My wife and I booked a 4 hour Fishing/Snorkeling trip with The Born Free II. Captain Herbie and First Mate Bruno were fantastic from beginning to end. The fishing was great! They asked us what type of fishing we wanted to do. We said “whatever allows us to catch the most fish”. We lost count of the amount of fish we caught. Just awesome. When my wife started to feel a little sea sick, the crew did everything they could to pack up the gear and get back towards the dock. Fish mounts arrived, thanks again for the awesome trip in August! So you’re ready to go deep-sea fishing or boating, right? What should you do now? 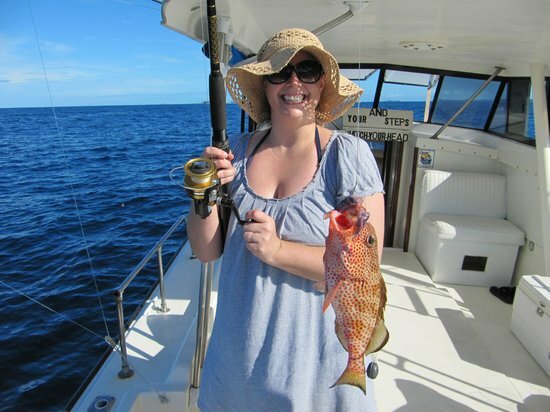 We suggest that you book your fishing charter as early as possible once you are sure of your dates of travel. Let us know when you plan to be here and where you will be staying. 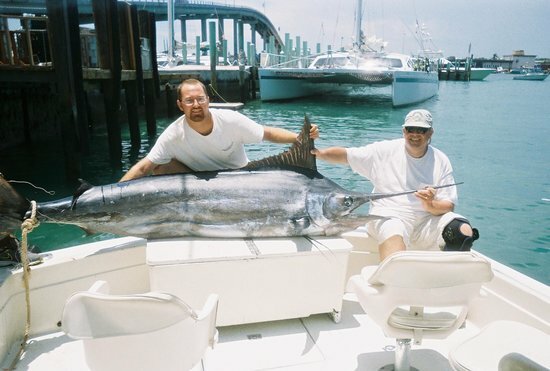 How many people will be fishing and do you have any special requests for your charter? Please note we can also accommodate you for a charter if you are coming in for a day on a cruise ship. We will need a credit card number to hold your reservation but you may elect to pay cash at the time of your charter. Please do remember we have a 24-hour cancellation policy, however if the weather at the time of the charter prevents a trip there is no penalty for cancellation. Old government forts – Fort Charlotte and Fort Montagu. Walk the 66 steps of the Queen’s Staircase to the water tower (you must walk up to enjoy). Enjoy several different types of food at restaurants from very casual to very dressy, from hotdogs and pizza to the best of Bahamian food to a fine steak. You should plan a walk down Bay Street Nassau to check out the shopping, much of it duty free for everything from straw placemats and dolls to beautiful gold and diamond jewelry. Take a ride on the water taxi over to Paradise Island or hire a cab for a scenic drive around New Providence Island. Go swimming at one of our beautiful beaches. Sail high and away in a parasail over Bahamas beaches. Please read through our list of frequently asked questions for further assistance in planning your trip. Or even a day trip to Exuma! Let us know what you and your party are interested in and let us make suggestions for an ultimate fun filled day in the Bahamian sun with Born Free Charters! BORN FREE FISHING CHARTERS, YOU AND A PICNIC ON A BEAUTIFUL TROPICAL BEACH! How about a picnic on a beautiful tropical beach? There are different beaches close to Nassau we can cruise to for a great picnic lunch. There is something about salt water and beautiful white sand combined with fried chicken and sandwiches. Have a wonderful swim after lunch in the crystal clear water by the beach. We’ll help you plan your menu and help to provide a wonderful day at the beach. Bahamas Sight Seeing at it’s Best! Envision The Bahamas site-seeing trip of your life! Start by traveling down the harbor noting the waterfront of downtown Nassau. At times you may see up to ten cruise ships parked at Prince George Wharf at one time. Continue your tour past the west end of Paradise Island, cross the bar and go into the ocean. Be sure to notice the amazing colors of nature’s paintbrush that intensify as you get further away from Nassau Harbor. As you cruise around the world renowned Paradise Island you will see beautiful Cabbage Beach and all the major hotels well known for providing amazing vacations. Pass through the Narrows and go west from Paradise Island to Rose Island where you can anchor for a picnic, just a short wade through amazing blue-green water to the beach. Notice beautiful Sandy Cay with all the coconut trees, often the scene of TV commercials (Tylenol for one). Cruise slowly back to port in Nassau remembering your once-in-a-lifetime scenic tour. Contact us today regarding all your Bahamas Sightseeing needs. Snorkeling in The Bahamas is unique for many reasons; it is set apart from other Caribbean destinations by it's diversity and its density of sea life, thats why we have developed an exclusive day full of fishing and fun in the reef just for the ocean lover who wants to get wet. Offering a high quality and professional service from the moment you come aboard and receive our safety briefing ensuring your comfort and safety throughout the tour. 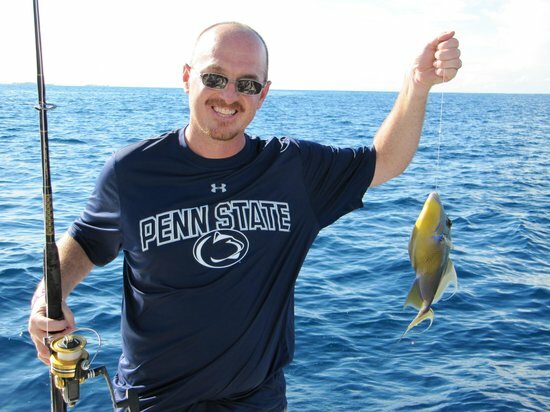 Deep sea game fishing starts within minutes or leaving the Nassau Harbor. Our local fishing ground knowledge ensures the best catch of the day.